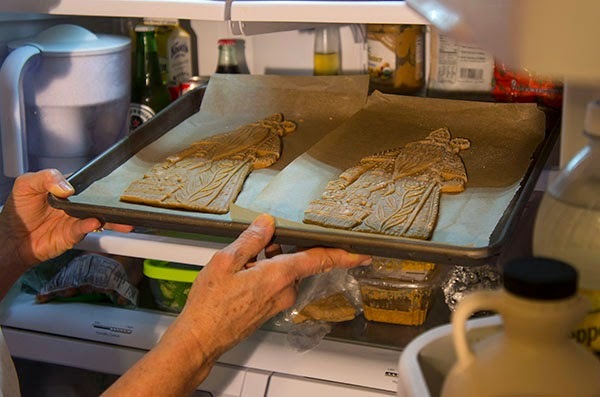 There are a lot of recipes and a lot of advice for making Speculoos, also known as Speculaas or Spekulatius - spiced cookies that are formed in wooden cookie molds. Some suggest the use of baking powder, baker's ammonia (hartshorn salt) or eggs as a leavening agent. Some recommend the use of brown sugar, some a mix of brown and white sugar, while others promote the use of honey or other liquid sweeteners to produce the easiest releasing cookies. Various dough chilling regimens are suggested as well as different techniques for coaxing the dough out of the mold. We tried many of these recipes. This is the one that worked for us. Our goal was to make a cookie that took the mold well, that retained the details of the design through to the finished cookie and that had good texture and taste. 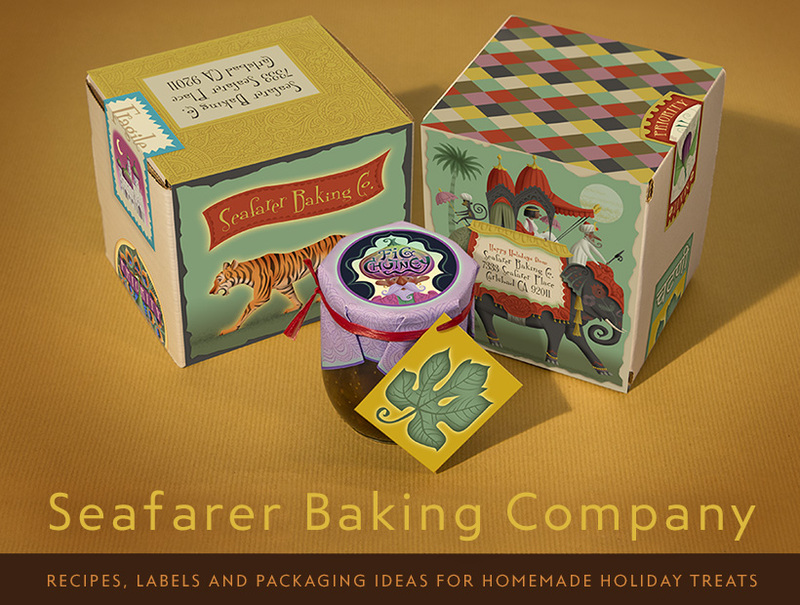 This recipe was perfected by Seafarer Baking Company's culinary mastermind, Bridget Sabin. Step One - Mix the dry ingredients thoroughly in a bowl and set aside. Step Two - Cream the wet ingredients with a mixer at medium speed until well mixed, about 2 minutes. Step Three - Slowly add the dry ingredients, mixing at a low speed, until all the ingredients have been incorporated. Step Four - Remove the dough from the bowl, fold it on itself a few times and form the dough into a brick about 1/2 inch thick, wrap in plastic and chill in the refrigerator overnight. Start by chilling the mold in the refrigerator for an hour or two. Keeping the dough, the mold and the cooking sheets chilled throughout the process is important. Making these cookies on a hot summer day may prove frustrating. Make sure you are using a properly seasoned mold. It should have received several coats of food grade mineral oil for the initial seasoning. At the beginning of a cooking session, you may want to refresh the seasoning with a coat of oil and let it dry completely. 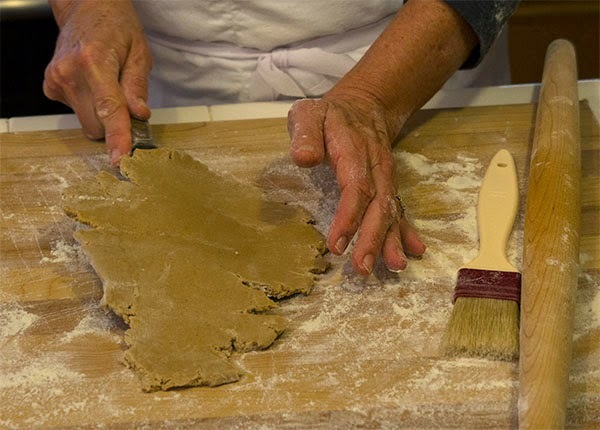 While you are making cookies, the butter from the dough naturally refreshes the seasoning of the mold. 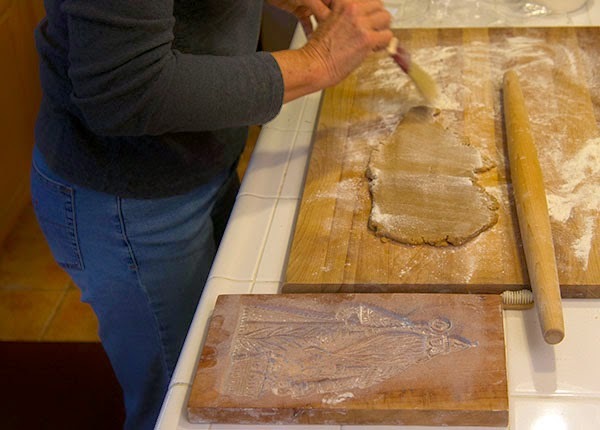 Begin by generously brushing flour into the dry mold cavity. 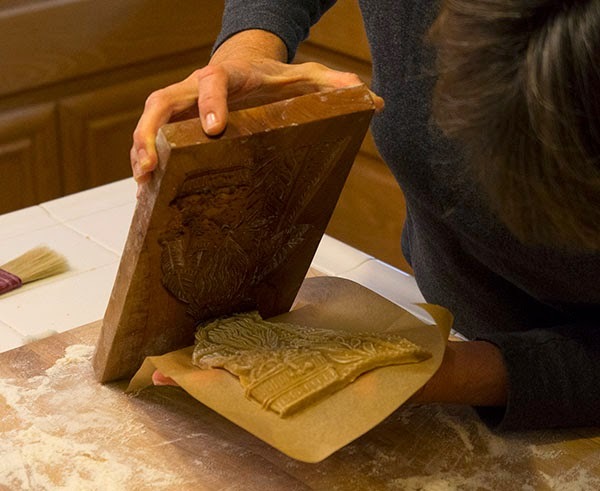 Rap the flour out of the mold, rotating the sides, so there is a thin layer of flour over the entire surface of the mold. ...until it is approximately the size of the cavity and slightly thicker than the deepest depth of the mold. 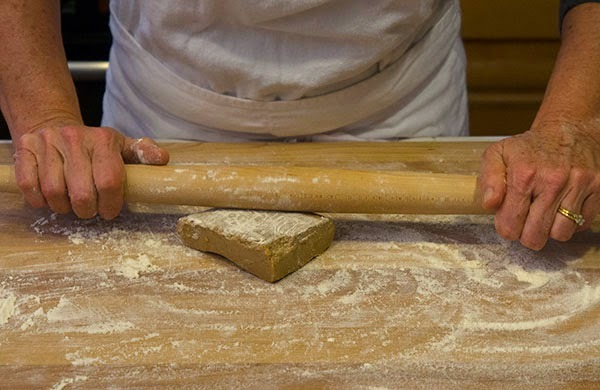 The dough is hard and requires a sturdy hand. 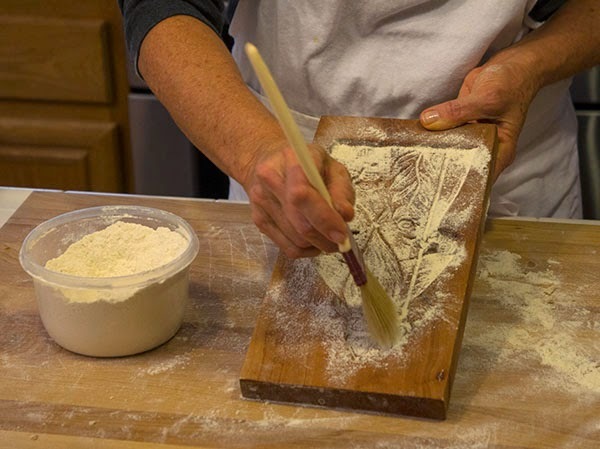 Brush the dough surface with a light coating of flour. It should be an even, thin coat. 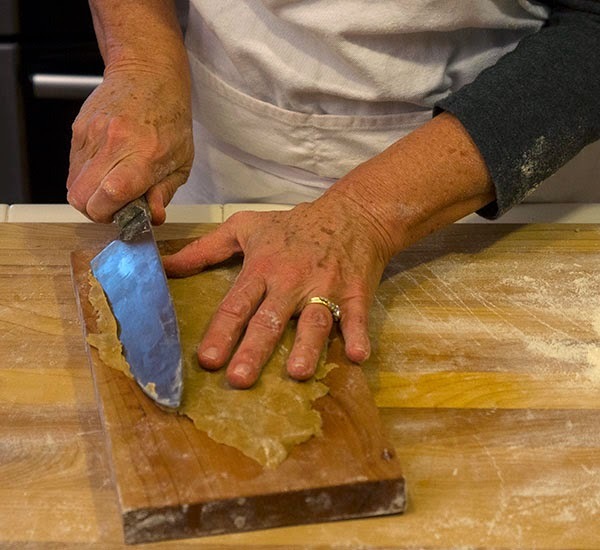 Using a dough scraper or a knife, lift the dough off the work surface. Place the dough onto the mold cavity. 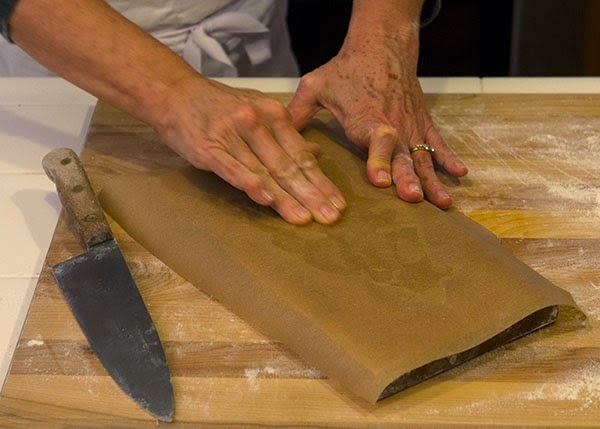 Press the dough into the cavity, shoving into the edges and then using a vigorous pressing motion with the palms over the entire surface. 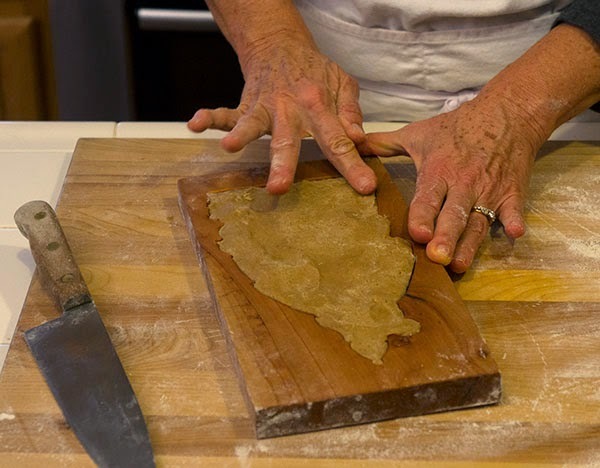 The trick is to push the dough into the details of the mold as completely as possible without overworking it such that the dough starts to warm up. There should be an excess of dough all around. Start by trimming the edges of the design. Then level the top. 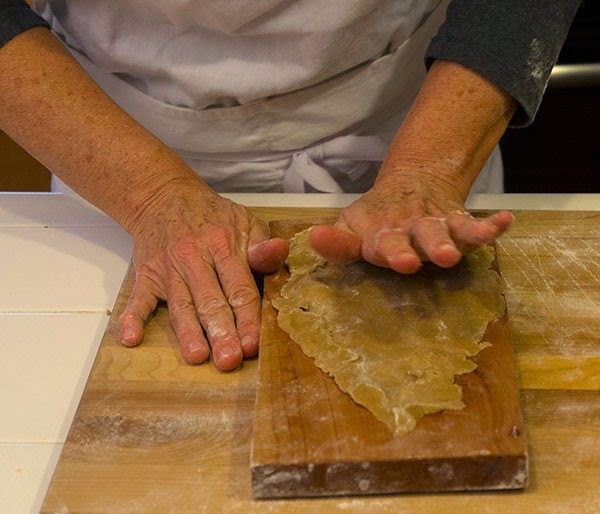 The surface of the dough should stand slightly above the top surface of the wood. Place any excess dough in the refrigerator. The next step is essential, push the edges of the cookie away from the mold. This greatly assists in the release of the cookie from the mold. 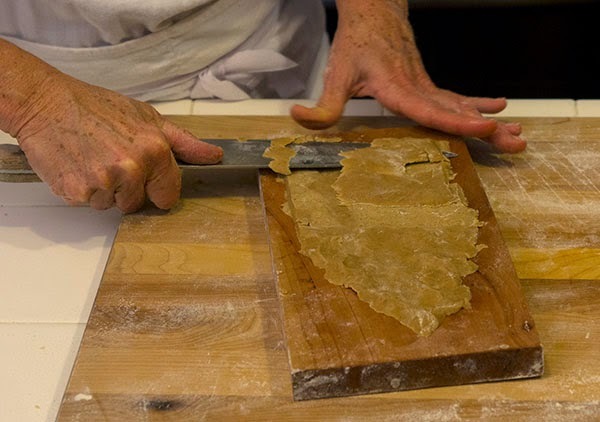 Place a sheet of parchment, cut larger than the design, on the cookie and press it into the cookie surface. 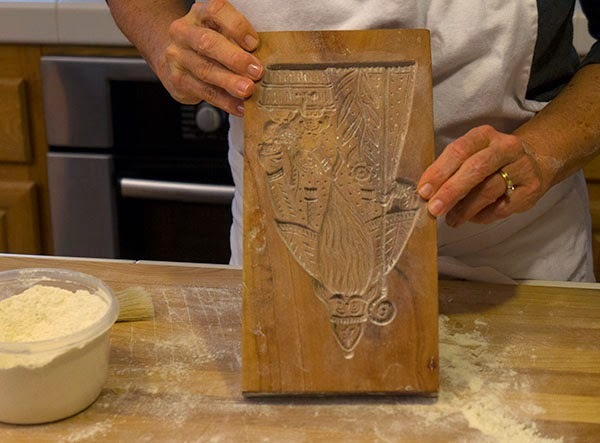 The parchment acts to stabilize the design as it leaves the mold. To rap or not to rap? We've tried all the methods and concluded that the best tasting cookie requires a recipe that is naturally going to stick to the mold. So, yes, several sharp raps are required to get the cookie to start to release. 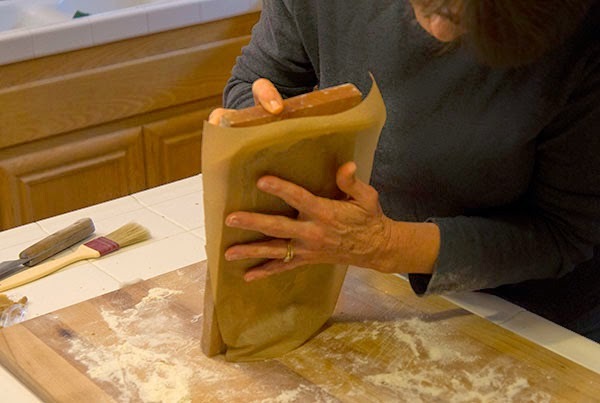 Hold the mold vertically while rapping and keep the parchment up against the cookie. 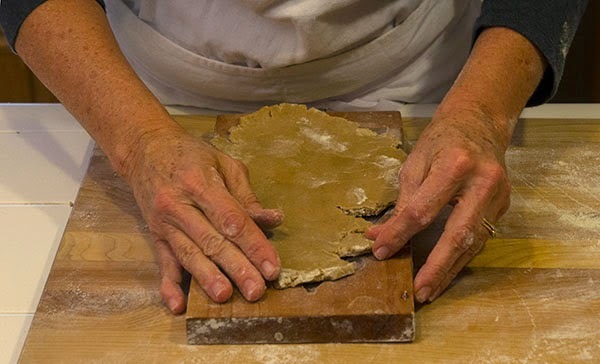 The parchment prevents the cookie from distorting as it loosens from the mold. The cookie should start to release from the mold. As you work with a given mold, you'll find that starting from the top or from the bottom will produce a better release. 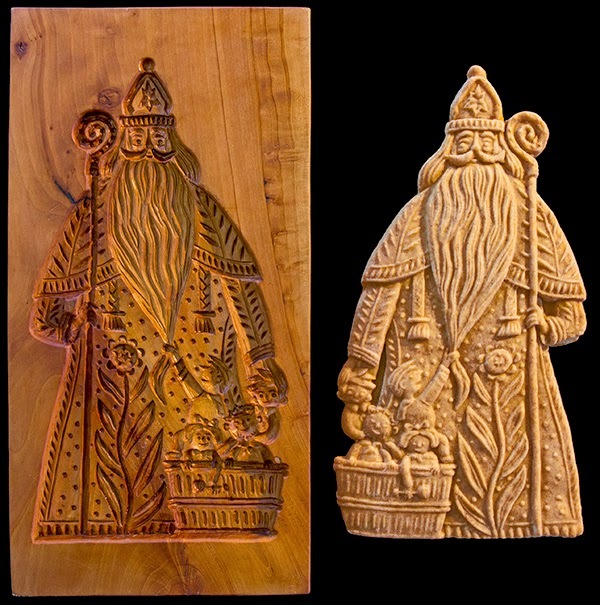 If you have a particularly complex design you may need to coax the cookie from the mold in certain problem areas with a fork or knife, but as much as possible let the cookie release from the mold at it's own pace. Be patient. It takes some time for the release to happen. Let gravity be the pacesetter. After placing cookies on baking sheets, still adhered to the parchment, put the pans back in the refrigerator for a half hour. If the cookie goes into the oven in a cold state, it will produce a superior design with finer details. Preheat the oven to 335 degrees. Set the racks to the upper and middle areas of the oven. Bake for 10 minutes, then rotate the pan 180 degrees and bake another 10 minutes until lightly browned around the edges. Smaller cookies will require less time. Place the cookies on a wire rack. When they've cooled a few minutes, slide the cookies off the parchment paper and continue to cool on the racks. Store the finished cookies in an airtight container. We tried different leavening options and found that the addition of baking powder produces an inferior design. 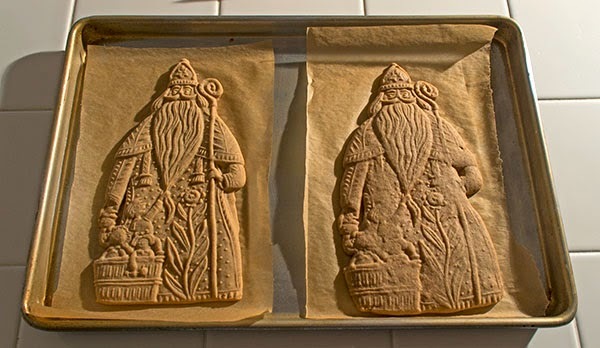 The cookie on the left, shown below, was made with egg and the one on the right was made with baking powder. They were identical before going into the oven. We also tried recipes that use liquid sweeteners. While these recipes make the release process easier and produce good designs, the cookie is dense. We were not happy with the cookie texture.